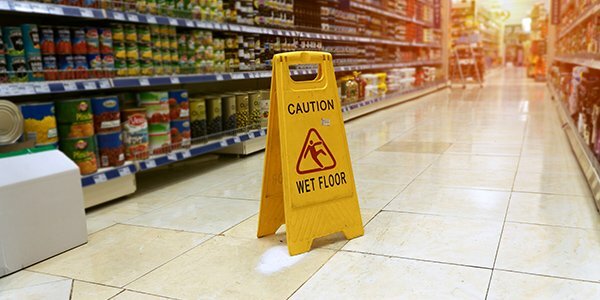 From slick store floors to icy sidewalks, slip and fall accidents account for an enormous number of personal injury lawsuits. So many, in fact, that you probably know someone (or know someone who knows someone) who has considered filing a slip and fall claim. And with so many stories out there, separating the truth from so many tall tales can be a challenge. Have no fear -- we're here to help. Here are five common myths about slip and fall lawsuits, and the facts behind the fiction. Accidents happen, right? If you want to avoid all risk, you have to just stay on your couch, correct? It's really nobody's fault. Don't let any of these arguments deter you. If you slipped, fell, and were injured on someone else's property, and the owner was negligent in maintaining the safety of the property, you may have a legitimate slip and fall claim. Yes, you can still sue if there was a warning sign. And yes, it may be more difficult to prove the owner's negligence if there was a sign. But the mere presence of a sign does not, by itself, bar you from suing for slip and fall injuries. Some slip and fall injuries can be minor -- a sprained ankle or bruised wrist. But some can be so serious as to cause not just physical harm, but psychological and social harm as well. Medical care and missed work are one thing, but the "inability to enjoy the day-to-day pleasures of life as a married couple, and temporary loss of sexual relations, significantly disrupted their common interests and social lives" is quite another, and you may be able to recover for suffering after a slip and fall. You may think that you need to leave any evidence of your slip and fall at the location where it happened, but that might not be the case. There is physical evidence you'll want to keep to bolster your claim, some of which may belong to you. While this one is technically true, there are time limits to injury lawsuits. State statute of limitations laws generally start the "clock" on your claim when the injury occurs, and many only allow two years to file an injury claim. These and other personal injury laws can vary depending on where you live, so if you're considering a slip and fall lawsuit, you should contact an experienced local attorney to discuss your case.